A man has been stabbed after saving a girl from assault in Kogarah. A 7-yo girl has been assaulted in a toilet before a man was stabbed trying to save her. 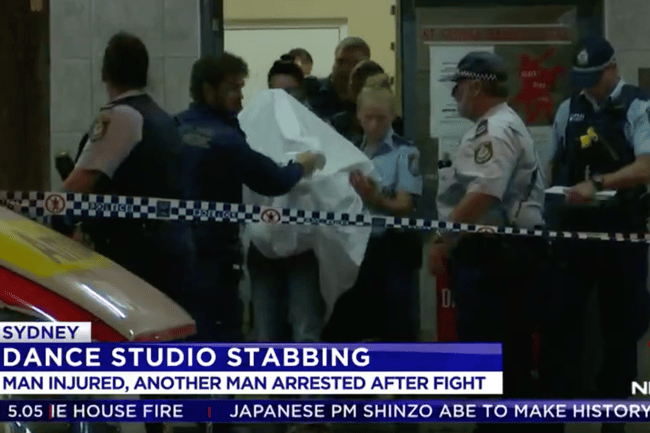 A man has been arrested after he allegedly sexually assaulted a child in a toilet at a Sydney dance studio and stabbed another man who came to the girl’s aid. It’s believed the 54-year-old man assaulted the seven-year-old girl in the studio’s toilet on Railway Parade in Kogarah on Thursday night. A 46-year-old man who confronted the alleged offender was stabbed in the abdomen and neck during a struggle. Bystanders came to the injured man’s aid and detained the offender until police arrived. The 46-year-old man was taken to St George Hospital in a stable condition. The girl was taken to Sydney Children’s Hospital for observation. The 54-year-old was arrested and taken to hospital with facial swelling and bruising. He remains under police guard and will be interviewed later on Friday. Superintendent Julian Griffiths said the man – from Kogarah – was not a staff member or known to the dance studio. “Investigators have not been able to identify he has any links to those commercial premises and it appears to be a random, isolated incident,” he told reporters in Sydney.